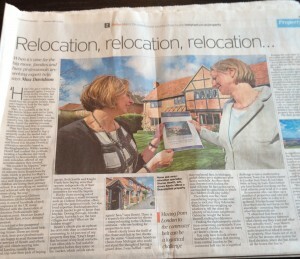 The Chiltern Relocation story went national over the Easter weekend as we were delighted to be featured in The Daily Telegraph. An increasing number of families are struggling to find a home and their preferred school in the right location for commuting and social amenities and are reaching out to relocation agents for the answer. Interested to understand more about the service relocation company’s provide and how the face of house hunting is changing, reporter Max Davidson joined Chiltern Relocation for the day. Max was keen to understand how we guide our clients to the right area, find the right homes for them and how we ensure we match the right school to the children and assist with securing school places. So we put Max in the shoes of our clients and took to the road. On orientation and viewing days we like our clients to get a good feel for a selection of towns and villages to enable them to compare and contrast. Whilst driving around chosen areas we point out the preferred roads, housing examples and prices, school catchments, commuting options and train times, social amenities on offer and sporting facilities nearby. Having the chance to compare and contrast areas in this way with all the essential information on hand enables our clients to make the right decisions. Having someone with in depth local knowledge means that you not only get the best out of an area but you also avoid any pitfalls. As Max pointed out, Buckinghamshire is much harder getting to know than Mayfair! We took Max around our local town of Beaconsfield and the outlying villages of Seer Green and Jordans and he was amused to hear some of our many house hunting stories. On one occasion we had a family interested in a house next door to rock star Ozzy Osbourne and we felt this was a moment when our local knowledge should reveal the identity of a potential neighbour! After a tour of the local area and an explanation of how we manage to secure the best properties for our clients (and manage school searches on client’s behalf) we headed to The Royal Standard of England, the oldest freehouse in England for an excellent lunch. Nestled in the countryside just a mile from Beaconsfield this pub has been here for over 900 years and was recently used as filming location for Oscar winning The Theory of Everything. Again Max commented that local knowledge really does pay off as we enjoyed tucking into local produce sat in historic surroundings! Excellent post and very timely given today’s news on home sale. It’s a tough issue I can cenitarly understand the apprehension for renting. It’s not as easy as some people may think. There are liability issues, not to mention the phone calls at 1:00am because a toilet is overflowing. It can be a job in and of itself, depending on the tenant. It’s advisable to have some set criteria (no pets, for example) and a in-person interview before letting someone have free reign to your home. Is renting ideal? No. Necessary? Probably.Fortunately, savvy companies are aware of the issue and are reviewing and revising their relocation policies accordingly. I think we’ll see some creative programs come out of this trend.